An adverse judgment could have triggered a political realignment in Tamil Nadu and brought the ruling party perilously close to losing its majority in the state assembly whose effective strength is 232. In a huge relief to the All India Anna Dravida Munnetra Kazhagam government, the Madras high court on Thursday upheld the disqualification of its 18 rebel MLAs loyal to sidelined leader TTV Dhinakaran by the Speaker of the Legislative assembly last year. An adverse judgment could have triggered a political realignment in Tamil Nadu and brought the ruling party perilously close to losing majority in the House whose effective strength is 232. Two seats are vacant. The 18 AIADMK MLAs were disqualified on September 18 last year by Speaker P Dhanapal under the anti-defection law after they met the governor and expressed loss of confidence in Chief Minister K Palaniswami. “There is no error apparent on the face of the record and the reasons assigned by the Speaker did not suffer on the grounds of breach of constitutional mandate, malafides, non-compliance of the rules of natural justice and no perversity is attached to the reasons assigned by the Speaker to disqualify the petitioners,” Justice M Sathyanarayanan said, dismissing a batch of petitions filed by the MLAs. The judge also vacated the interim orders passed by the court granting a stay on floor test and a direction to the Election Commission not to declare the seats of disqualified lawmakers vacant. The disqualified MLAs now have the option of appealing the judgment in the Supreme Court. The Election Commission will also be free to order by-elections to these seats. Justice Sathyanarayanan said the petitioners had failed to substantiate the allegation of malafide against the Speaker. “In the case on hand, the impugned order was passed by a high ranking constitutional functionary, namely the Speaker, and though allegations are made as to malafide act, bias and partisan attitude, in the considered opinion of the court, those allegations/averments have not been substantiated in the form of proof or tenable materials,” the judge noted. 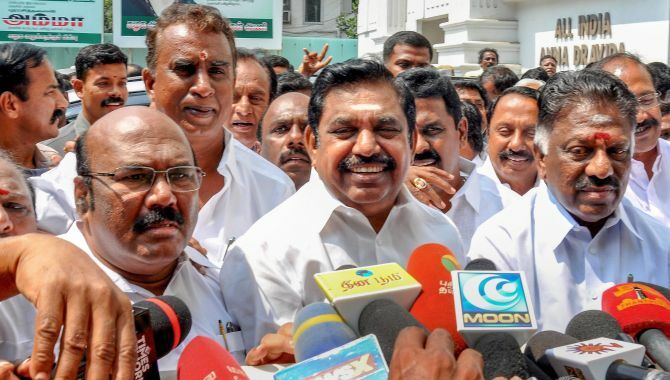 Thursday’s verdict came as a massive relief for the Palaniswami government as the restoration of the membership of the rebel MLAs could have set off realignment in the state’s politics with the Dhinakaran camp likely joining hands with the opposition Dravida Munnetra Kazagham and bringing it dangerously close to losing majority. The DMK and its allies -- the Congress and IUML together -- have 97 MLAs, and with the 18 rebel AIADMK forging an alliance with them besides independent legislator Dhinakaran himself, their strength would have risen to 116, which is equal to that of the ruling party. Two assembly seats are vacant, including Thiruvarur, which was represented by DMK patriarch the late M Karunanidhi. Reacting to the verdict, Dhinakaran, who now heads the AMMK after being sidelined in the AIADMK, said he would consult the MLAs loyal to him before deciding whether to go in appeal in the Supreme Court. “We expected a favourable verdict but it is not a setback. I will consult the 18 MLAs on whether to file an appeal in the Supreme Court. Personally, my feeling is we should go for by-elections,” he said. A division bench of the court comprising the then Chief Justice Indira Banerjee and Justice M Sundar had delivered a split verdict on the petitions on June 14. Banerjee had upheld the Speaker’s order disqualifying the MLAs, while Sundar passed a dissenting judgment. The Supreme Court had then appointed Justice M Sathyanarayanan to hear the matter and decide afresh. Justice Sathyanarayanan said though his attention was drawn to some “subsequent developments and events”, he was not inclined to take cognisance has he was only tasked with the responsibility to test the impugned order with material that was available before the Speaker when he ordered the MLAs’ disqualification. The judge, like Banerjee, also referred to a similar development that had occurred in Karnataka in 2010 when Bharatiya Janata Party’s B S Yeddyurappa was the chief minister. On October 6, 2010, 13 BJP MLAs and five independents had submitted letters to the governor of Karnataka withdrawing support to the Yeddyurappa government. All of them were disqualified with Speaker K G Bopaiah claiming they had given up their membership “voluntarily”. The Supreme Court had on 2011 set aside the Speaker’s order on the ground of violation of the principles of natural justice. Banerjee too had in her order quoted the apex court verdict to say the disqualified Karnataka MLAs were found not to have been given reasonable opportunity to explain their representation. Banerjee had said the petitioners were given chance to present their case but they chose not to appear before the Speaker, and as such, they cannot complain of breach of audi alteram partem (hear the other side) rule. Justice Sundar, in his 135-page judgment delivered separately, struck a dissenting note, insisting that Dhanapal’s order “deserved to be set aside on grounds of perversity, non-compliance with principles of natural justice, mala fides and violation of the constitutional mandate”. Justice Sundar, however, said the entire controversy could have been put to rest had the Speaker conceded the plea of the petitioners to allow them an opportunity for cross examination and give oral evidence. He had said that the Speaker’s order, even if legally correct, deserved to be set aside for mala fides (in bad faith). 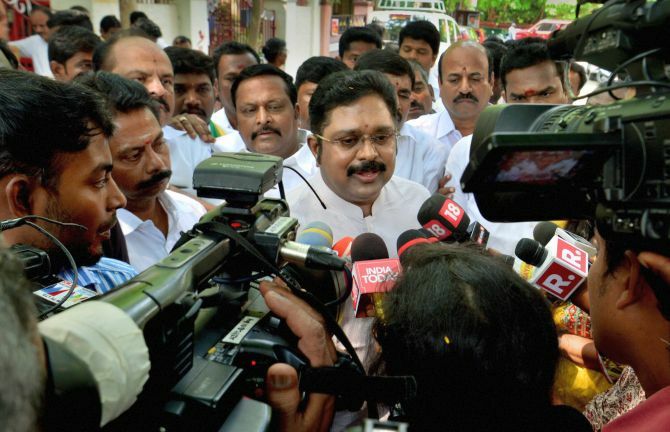 More bad news coming for Dinakaran?